performances. 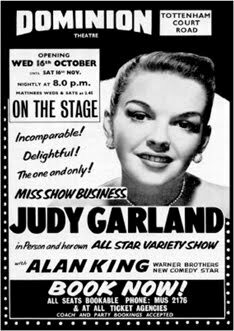 One such performance was the legendary month long residency of Hollywood star Judy Garland in a theatrical production of The Judy Garland Show which ran from 16 October 1957. However, the Dominion remained first and foremost a successful cinema. 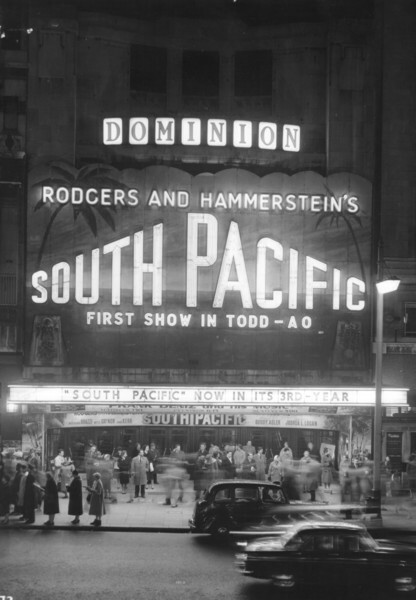 In 1958 a film adaptation of Roger and Hammerstein’s South Pacific ran for a record breaking 4 years and 22 weeks. This was followed by the European premiere of Cleopatra in 1963 and the premiere of The Sound of Music in 1965 which went on to run at the Dominion for 3 years. In 1977 George Lucas’ Star Wars premiered jointly at the Dominion and the now demolished Leicester Square Theatre, with The Empire Strikes Back and Return of the Jedi also premiering at the Dominion in 1980 and 1983 respectively. By the end of the 1970s, with the rising popularity of multiplex cinemas and television, the era of single screen cinemas and long-running film showings came to an end and the Dominion entered another period of adjustment as it adapted to being primarily a venue for music acts. Musical talents including David Bowie, Madness, The Pointer Sisters, The Four Tops, Bon Jovi and Van Morrison played at the Dominion throughout the 1970s and 80s. Change came again in the late 1980s as the Dominion began to return to its original function of a musical theatre venue. In 1986 the interior of the theatre was controversially painted black for the world premiere of musical Time featuring a holograph of Laurence Olivier. 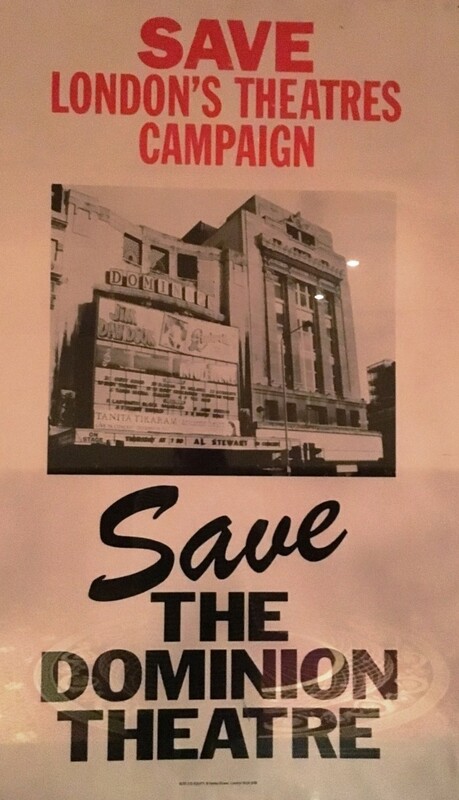 However, this new era of the Dominion almost came to an abrupt halt when plans were drawn up to pull down the theatre and replace it with a car park, however, an aggressive campaign ensued and the theatre was finally saved from destruction in 1991. 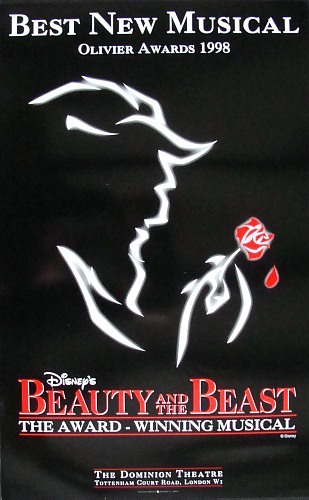 Following this triumph and the acquisition of the Theatre by the Nederlander Group the Dominion went on to cement its place as a home for the big musical throughout the 1990s with Grand Hotel (1992), Barnum (1992), Grease (1993), Scrooge (1996) and Walt Disney Theatrical’s Beauty and the Beast (1997) which won ‘Best New Musical’ at the 1998 Olivier awards. 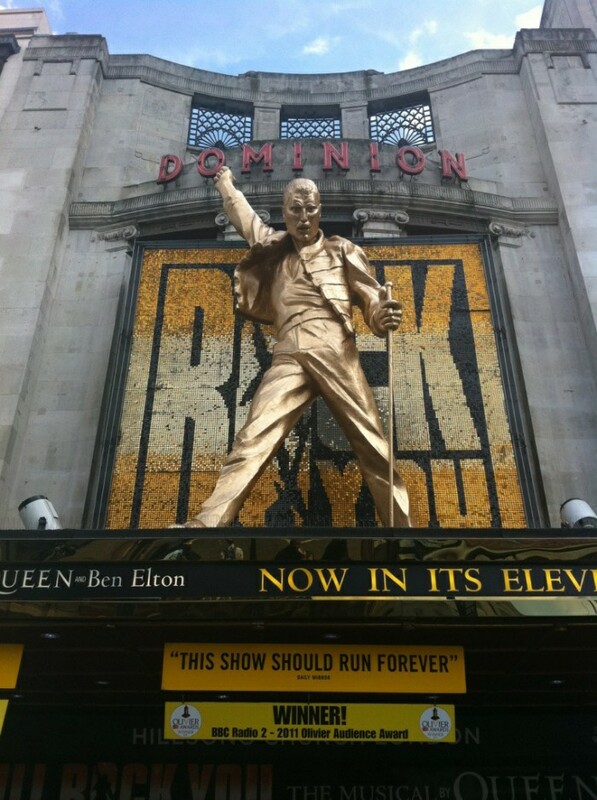 Such was the acclaim of the Dominion as a venue for large audiences that The Royal Variety Performance was held at the theatre 7 times between 1992 and 2001. The new millennium sustained the success of the 1990s firstly with a musical adaptation of Victor Hugo’s Notre Dame de Paris (2000) before theatrical rock phenomenon We Will Rock You opened. The smash hit show ran for 12 victorious years, winning the Olivier Audience Award for Best Long-Running Show in 2011. The theatre became famous for the Freddie Mercury statue that adorned the facade of the theatre and has a hospitality suite named in his honour which features photographs and artefacts loaned to us by the Mercury Phoenix Trust. We Will Rock You rocked the Dominion for the last time on 31 May 2014 after which the Dominion underwent a multi- million pound renovation reopening in September of the same year. Despite a colourful past and its altering use, the one constant the Dominion has maintained is its capacity to stay at the forefront of technological development. The 20th Century saw John Logie Baird trial his large screen colour projection television at the Dominion before the Todd-AO system was installed in 1958 projecting high-resolution film onto a wider screen. In the 21st century, technological development moved backstage, our modern flying system, which controls the movement of sets in and out of the stage, has the ability to hold over 40 tonnes of weight allowing us to house the largest West End and Broadway sets. In addition technology such as the building management system, which ensures the efficiency of our heating and cooling systems, as well as LED lighting, has resulted in the theatre reducing its carbon footprint by over 40% since 2010 and the Dominion remains the only West End theatre to have been awarded the Gold Award by the Green Tourism Scheme. For over 80 years the Dominion has been a mainstay of the West End, whether it be for film, music, variety acts or theatre and whilst the type of entertainment may change, the Dominion always remains a venue ahead of its time.